If you never have tried cauliflower rice you have put it on the to do list! So simple and tasty and for those who have a low carb diet it is perfect. When ever I make cauliflower rice I do up a big batch and keep in the fridge and use it up over the next few days. This week there was a cauliflower sale at our local veggie shop so I bought 2 – I guess it means I will be exploring a few different ways of cooking it up so we don’t get bored. This recipe is hearty enough to be a main meal or you can dish it up as a side dish. If you prefer more ‘rice’ adjust the quantity of cauliflower to suit. Fry the garlic and onion in oil till soft. 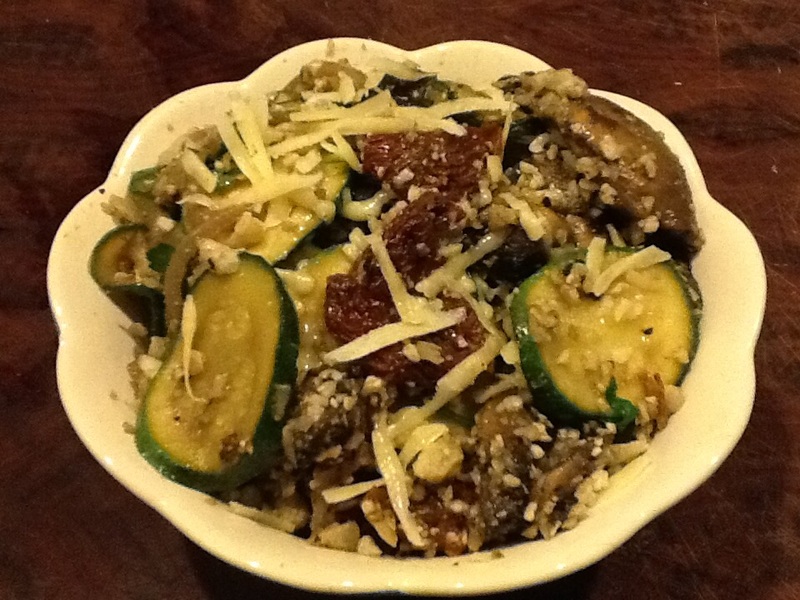 Add zucchini and the mushrooms, fry till cooked but still firm. Add the sun dried tomatoes and the cauliflower rice, continue to stir to blend the flavours. Just before serving add the parsley and stir through.